At birth give 10cc of Maxibac Calf Gel. On the following day, begin feeding Promax. Fed daily, Promax will maintain high levels of digestive bacteria plus colostral proteins and peptides to help drive immune system growth and function. Promax should be fed daily until one week after weening. At first sign of scours give 10cc of Maxibac Calf Gel and start Source E. Continue with milk or milk replacer feedings as normal. If scours persist for 6-8 hours, repeat the dose of Maxibac and continue Source E. In case of severe scours give 15cc of Stand Up. Repeat this in 6 hours if necessary. Start Source E immediately. Source E should be fed 2-3 times the first day and 2 times on the second day. 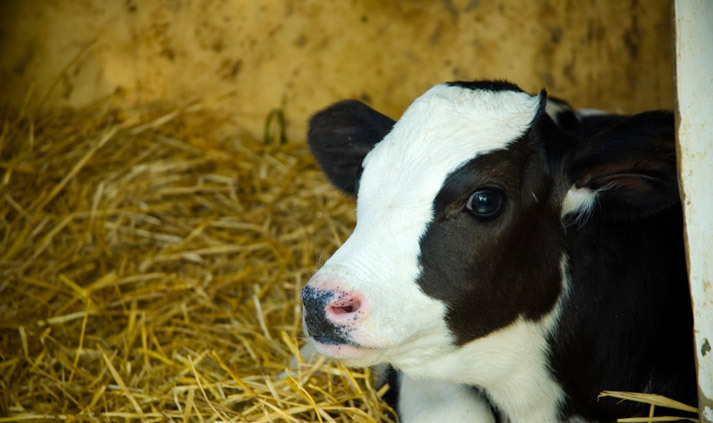 Milk and milk replacer feedings should continue unless advised otherwise by a veterinarian. Maxibac Calf Gel is a concentrated gel containing billions of specialized lactic acid bacteria and yeast culture specially formulated for monogastric animals. It is used at birth to populate the gut with beneficial bacteria that can protect the animal from the overgrowth of harmful organisms. The yeast helps protect the animal from harmful organisms and makes the gut environment more “Friendly” for the digestive bacteria. Give Maxibac at birth and when calves face environmental stresses such as transporting, environmental changes and change in feeding. When a calf scours, Maxibac will restore the level of beneficial bacteria in the gut and restore gut pH to levels that will inhibit harmful organisms. Source E is an extrely aggressive electrolyte supplement for the rehydration of calves who are scouring or have insufficient water intake. In conjuntion with Source E, use Maxibac or Stand Up to return gut Ph and digestive bacteria to normal. Source E contains a “plasma specific buffer” that corrects acid conditions in the blood without raising gut pH or interfering with milk absorption. Source E contains no sodium bicarbonate therefore, milk and milk replacer feedings can continue as normal. It is extremely high in both energy content and electrolyte concentration for quick results. Available in 4 oz packs and 10lb or 25lb containers. Stand Up Calf Gel is a more aggressive culture of lactic acid bacteria that can live in more hostile environments. Stand Up contains a nutrient rich media that supports the growth of beneficial bacteria in the face of adverse conditions. It is given when extreme environmental or physical problems exist and the animal is in danger of imminent death. Promax Calf formula is a dry direct feed microbial supplement that is added daily to milk, milk replacer, or feed. Promax provides beneficial levels of digestive bacteria to populate the gut, regulate pH and promote nutritional efficiency. Promax enzymes help improve digestive efficiency and nutrient absorption. A yeast culture developed specifically for monogastric animals helps maintain a beneficial environment for the digestive bacteria and helps inhibit harmful organisms.